This post was contributed by Ryan Watkins, Professor at George Washington University and developer of wesharescience.org. Sharing your research with the world can be challenging. After months, or years, of grueling effort to design, fund, and conduct a research project, the vast majority of what gets published in scientific journals flies under the radar and gains little notice. A 2009 research study found that 12% of articles in medicine, 27% in natural sciences, 82% in humanities, and 32% in the social sciences go uncited. Creative titles and controversial topics can garner some attention, though in reality much of our research still fails to reach our primary target audience – colleagues in our field. Secondary audiences that may also benefit, such as researchers in other countries or ot­her disciplines, are even less likely to read about our work. We therefore must discover new ways to reach our colleagues and other interested audiences quickly and concisely – video might be part of the answer. Online tools like ResearchGate, GoogleScholar, Academia, ORCID, and MyScienceWork all help us share research. Open access journals also provide many opportunities. But these continue to rely on printed journal articles as the dominant tool for sharing ideas. This leads to everyday obstacles for many of us, such as finding time to read all of these articles. Most of us hardly have time to keep up with all the research being published on our own topic. Only on occasion do we then have time to read about research from other disciplines, or from other countries, to explore new connections to our research. So how can we fault others for failing to find our work? I study processes for diagnosing and resolving organizational performance and often have to be able to quickly synthesize information from a variety of fields in order to provide useful solutions to complex challenges. As a cross-disciplinary researcher, the challenge of keeping up on studies in many disciplines has been a long brewing frustration for me. I read a variety of psychology, business, personnel, and sociology journals when I get a chance, but I know that there is much more research that I am missing out on. Yet I believe that the big breakthroughs in my discipline, education, will come from ideas garnered from research in another disciplines – maybe psychology, maybe economics, or maybe even biology or international relations. Many of the challenges in science today are too complex for any single discipline to solve them on their own. According to a Nature News Article, since the 1980s researchers have been increasingly citing research from outside of their disciplines. Included in the article is an interactive chart where you can see the yearly interdisciplinarity index of research for single or multiple disciplines – you can select the disciplines and the years. Which leads to the question of how we can support researchers as they try to keep up with the growing amount of interdisciplinary research while at the same time increasing interdisciplinary citations in their own work. Of course not all research has to be influenced by research in other disciplines. But there remains a great deal to learn from the science of others. Video abstracts about research, especially published research, have grown in popularity over the last decade. Research by Scott Spicer at the University of Minnesota helps illustrate this: “In terms of total view count and videos published, YouTube reported a total of 865,995 views for the 926 video abstracts identified. The journal Cell had the largest average view count per video abstract at 2,947 views. The journals Current Biology (2,500 views), Journal of Number Theory (1,519 views), and Gastroenterology (1,046 views) rounded out the top four average video abstract view counts.” For researchers looking to garner more attention for their work, a video abstract may be a useful tool for turning video views into online article downloads – especially if they are published in open access journals. After watching these trends for a few years, I decided to look at what online tools people generally like to use to share ideas – with the general goal of seeing if and how they are being used to share science. TedTalks are very popular, though they focus mostly on highly innovative ideas rather than on the day-to-day research that is the backbone of science. Facebook is continuing its growth, and while many publishers and researchers have Facebook pages, few share any details about their research itself. Pinterest is also a favorite for millions and their visual format is quite appealing to many audiences. While all of these platforms were developing, Google acquired Youtube and has been growing its online video market ever since. The take home message of all of this appears to be that video is the future in terms of communicating ideas. In 2012, for example, 3 billion hours of video were watched each month, in 39 countries, and in over 54 languages. While most scientific videos were for entertainment or basic education (i.e., learn why water freezes) there was a growing number of online research abstracts. 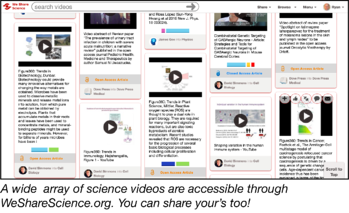 With journals in medicine, physics, math, and a few other disciplines leading the way, the future of complementing published research with video overviews was growing quickly. Taking what I loved from each of these platforms (such as social networking, visual appeal, instant sharing across multiple other sites), I created a new platform for sharing video abstracts about research: www.WeShareScience.org. 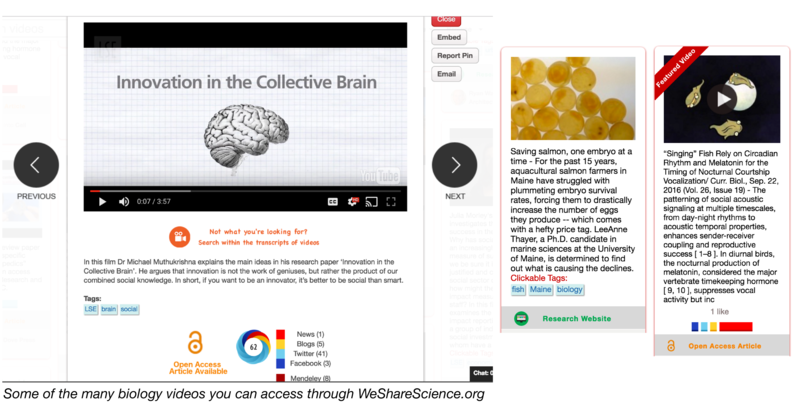 WeShareScience is a free platform for sharing short, 3 to 5 minute videos about research. Videos can be shared by research scientists, faculty, students, private sector researchers, or pretty much anyone applying the scientific method to a question. Videos from any discipline are welcome. Up to this point most videos are based on research that has been published, but many discuss in-progress research, proposed research looking for funding, or are by researchers for whom English is a second or third language (making publishing their research all the more challenging even when it is of quality). On the site you can, for example, learn about how researchers are using “big data” to look at Lyme Disease in new ways. Or learn about the results of studies on reducing antibiotic prescriptions for respiratory tract infections. The video abstracts provide a brief introduction to the research and, after watching the video to determine if you’d like to learn more, you can then link to the journal article, find blogs about the study, or even review Facebook and Twitter comments. ImpactStory, a website that helps researchers go beyond citation rates to measure the impact of their contribution. It offers a 5-step process and several examples for creating effective research videos. Karen McKee, also known as the science videographer, is a retired botanist and oceanographer who has a blog and several videos on sharing your research through video. Liz Haswell and Eric Hamilton, biology professors at the University of Washington in St. Louis, offer guidance on how to make a low-cost whiteboard video about your research. The videos on WeShareScience are not hosted on the platform, they can be hosted on YouTube, Vimeo, and other platforms (such as university websites). WeShareScience is a social platform that provides links to the videos, keeping the copyright and control over the videos with the researcher and the host site for the video. With the mobile version of site, researchers can also reach new audiences that may never access online journals or even use a computer. “Singing” Fish Rely on Circadian Rhythm and Melatonin for the Timing of Nocturnal Courtship Vocalization. The video summarizes the research of Drs. Feng and Bass published in a recent issue of the open access journal Current Biology. 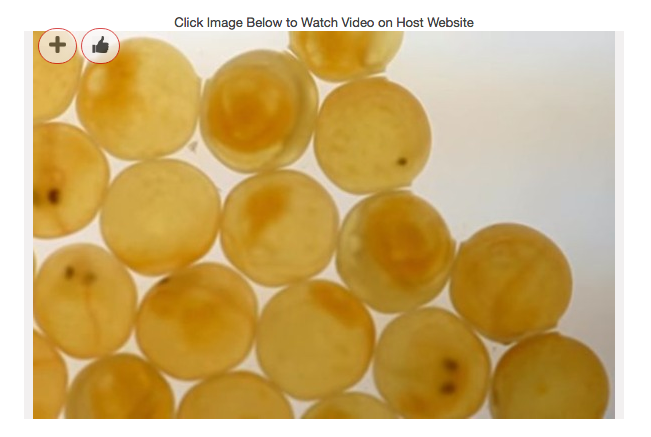 Saving salmon, one embryo at a time – A video by LeeAnne Thayer, a Ph.D. candidate in marine sciences at the University of Maine, about her research on plummeting embryo survival rates. The goal of the WeShareScience project is to find new and exciting ways to share ideas derived from research. The platform uses video to complement traditional print journals and expand our ability as researchers to reach new audiences that may otherwise never learn from the valuable research we are doing. Browse the site, learn from others, share ideas, and let the world know about your science! 1. Larivière, Vincent, Yves Gingras, and Éric Archambault. "The decline in the concentration of citations, 1900–2007." Journal of the American Society for Information Science and Technology 60.4 (2009): 858-862. 2. Van Noorden, Richard. "Interdisciplinary research by the numbers." Nature 525.7569 (2015): 306-307. 3. Spicer, Scott. "Exploring video abstracts in science journals: An overview and case study." Journal of Librarianship and Scholarly Communication 2.2 (2014): 2.